The AV society was originally formed to support and encourage boys who showed an interest in sound and lighting and who wanted to be involved in set up and running of audio visual for House and School functions. The AV society is now interwoven in the fabric of Bishops and audio visual demand continues to grow at an exponential rate. Virtually no function takes place without AV involvement of some kind. AV society members are thus involved in a broad spectrum of functions and events, from providing big screen presentations in chapel, PA systems for sports days and galas, to highly technical sound and lighting events. The AV Society prepares extensively for the various plays and musicals which take place in the Memorial Theatre. The boys are privileged to work with top class equipment, including Martin lighting equipment and Sennheiser wireless technology. The society strives to improve with every production. The AV society members are custodians of the Memorial Theatre’s digital sound and lighting systems, the operators of the Memorial Chapel’s state-of-the-art Community line array and the providers of professional PA and lighting equipment to the school from a sound equipment storeroom which is the envy of most schools in the province. 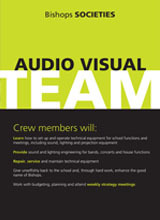 Members of the AV crew receive mentorship from ODs and professional companies who help out with large events. Boys learn how to programme lighting, set up audio for bands and musicals, and service and maintain audio and lighting equipment. In addition to the technical expertise that they develop, the boys also learn collaboration, communication and organizational skills. The society members are also closely involved in the decision-making process regarding budgeting for new equipment during the weekly meetings. Each year a senior(s) is chosen to lead the society. Membership to this society is limited and members need to prove themselves reliable and trustworthy if they wish to remain in the society. Yet anyone with a passion is welcome to join. Some of the highlights of AV are the set-up of multi-venue streaming and viewing during Eisteddfod. Spectators are able to sit in marquees and watch the events in real time on big screen TV from venues around the campus. The boys annually do a magnificent job in assisting with the various Houses’ variety concerts as well as doing the lighting and sound for the Matric Walk Down to the Matric Dance. A yearly highlight for the senior boys involved is the school play, where boys set up, program and run sound and lighting for the plays. Past highlights also include Edinburgh Festival performances where senior AV society members handled audio and lighting requirements. A calendar highlight for AV is the Bishops Pops, where boys get to shadow technicians and help out where appropriate with an amazing event. The AV society meets during Monday Open period to discuss the week ahead in G4 or the theatre. If you wish to join, contact Mr Petersen.